Grassroots democracy: members of DRC, PRBRC, and Northern Plains head to the Capital to keep commonsense methane rules. Update: The comment period ended with well over 400,000 concerned residents weighing in. While 99.8% of the comments were in favor of keeping strong methane protections, there has been no indication that the outpouring of support will sway Secretary Ryan Zinke. WORC will continue to follow the story. Clean air. A fair return to taxpayers. No waste of a non-renewable resource. A fair opportunity to weigh in on decisions that directly impact public health. These are not unreasonable things to want, or to ask the administration to ensure. Members take the fight to DC. From left, Sara Kendall, Wayne Lax, Sue Beug, Lisa and Walter DeVille. Since the Bureau of Land Management (BLM) does not charge royalties for most wasted methane, the American taxpayer is literally losing money – while companies are making money using our public lands for energy extraction. In fact, oil and gas companies waste more than $330 million worth of natural gas annually that could be used to heat homes, power vehicles, or generate electricity. Enough natural gas is wasted to supply heat to a city the size of Chicago for a year. Also, in addition to the release of methane (a potent greenhouse gas), so are pollutants like the carcinogen benzene, and volatile organic compounds that have been shown to cause serious health issues. In 2016, the BLM released a Methane Waste Prevention Rule in order to reduce the leaking, flaring, and venting of natural gas and cutting methane waste on federal public lands and tribal lands. Commonly known as the BLM methane rule, this measure has been under attack multiple times by the Trump administration and industry groups. Earlier this year, the BLM proposed a revised rule that would remove all meaningful provisions requiring monitoring and the limiting of leaks and intentional venting and flaring. On Monday, April 23, the BLM’s comment period on this revised rule closes – without any public listening sessions or public hearings being held, and no guarantee that the agency will take written comments into account. This means that the Americans affected by this proposed revision aren’t being heard, and that is unacceptable. Conversely, the 2016 rule was the result of more than three years of work, and four listening sessions and four public hearings. 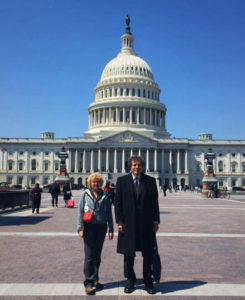 Sue Beug and Wayne Lax spoke to their congressional offices about the BLM’s gutting of the methane rule. 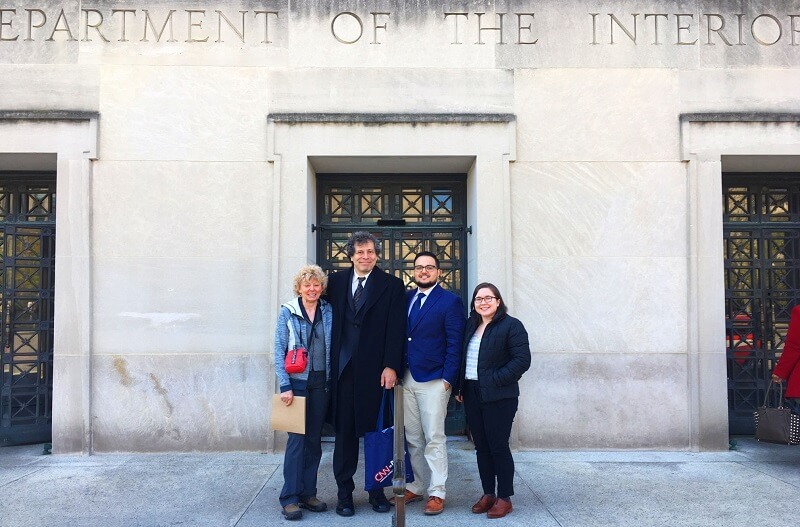 That’s why, last week, WORC brought four constituents impacted by methane pollution to Washington, DC, to defend the 2016 Methane Waste Prevention Rule and demand similar opportunities for in-person public comment on the proposed revisions. These members may hail from Montana, Wyoming, and North Dakota, but they represented the interests of all westerners affected by this rule, who want to protect their natural heritage, safeguard the health of their communities, ensure fair compensation for use of public resources, and prevent the waste of this non-renewable resource. 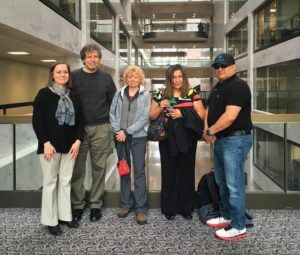 Sue Bueg of Red Lodge, Montana; Wayne Lax of Cheyenne, Wyoming; and Lisa and Walter DeVille of Mandaree, North Dakota met with their representatives and senators to share their concerns about gutting the Waste Prevention Rule, and to ask for their help in drawing attention to the fact that BLM has held no public meetings. They also met with representatives from the Department of the Interior and the Bureau of Land Management and asked them to consider extending the comment period so that public meetings can be held. Thank you, Sue, Wayne, Lisa, and Walter!